When the tap water of more than 500,000 northwest Ohioans was declared unsafe in August 2014, the three-day crisis caused global concern. Most was focused on how high levels of microcystin in citizens’ Lake Erie-fed tap water could affect those using it to drink, cook and bathe. There was scant discussion regarding how the toxin, which is caused by certain freshwater cyanobacteria found in algal blooms, affects wildlife in and around freshwater lakes such as Lake Erie because little research existed. 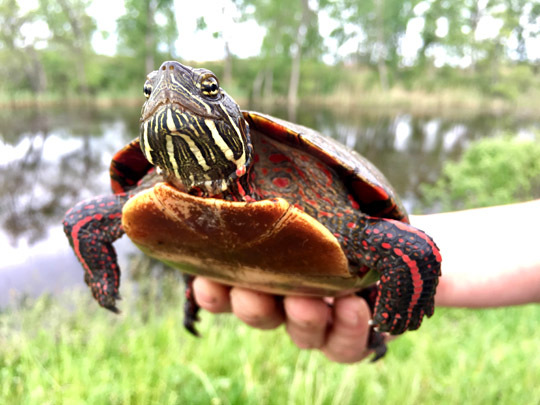 This painted turtle from the Ottawa National Wildlife Refuge in Oak Harbor, Ohio, was trapped and released by Dr. Jeanine Refsnider and her assistants after they took measurements to assess the effects of algal blooms on the reptile. 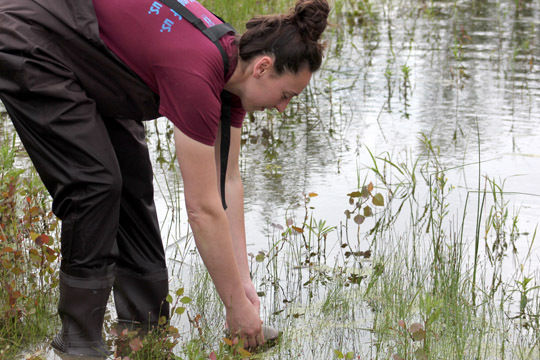 Dr. Jeanine Refsnider, assistant professor of ecology in UT’s Department of Environmental Sciences, is among the first to study how the harmful effects of algal blooms influence the health of Lake Erie wildlife, particularly turtles. 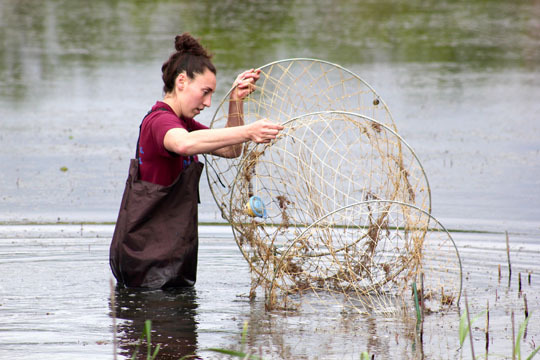 Refsnider and her team have been trapping turtles at Ottawa National Wildlife Refuge in Oak Harbor, Ohio, since mid-May and will continue through next month. In the field, they take baseline measurements, such as weight and size; determine the genders; check females for eggs; count the number of leeches clinging to shells; and photograph the shells. 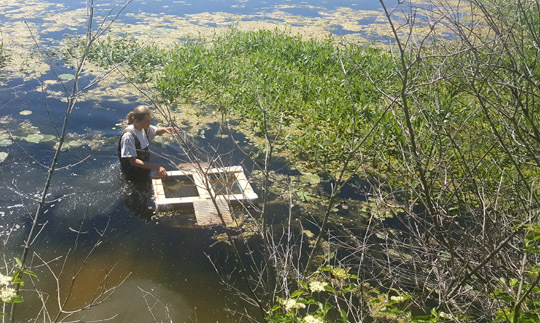 Dr. Jeanine Refsnider set up a trap to catch turtles at the Ottawa National Wildlife Refuge in Oak Harbor, Ohio. The turtles are not harmed by the tests performed in the lab or field, she said. “Turtles that aren’t able to bask as much as they should tend to have more leeches and more algae growing on their shells, and we think that’s an indicator of worse health,” Refsnider noted. The team also will take blood samples from each turtle’s tail for various assays to be examined in Refsnider’s lab. “We’re looking for baseline levels of physiological stress,” she said. “When an organism is exposed to a longer-term stressor, the ratio of different types of white blood cells changes. It takes a few days, but you can actually get an estimate of their stress level by counting the number of white blood cells and looking at this ratio. 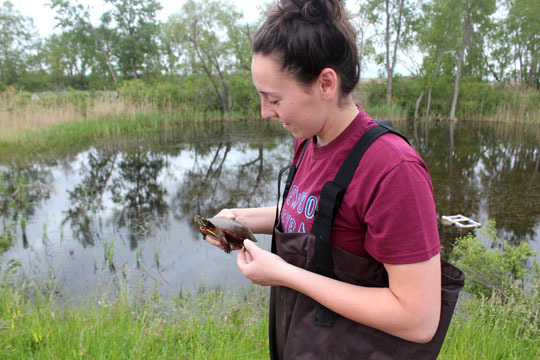 Jessica Garcia, a graduate student pursuing a master’s degree in biology, walked a painted turtle to the water at the Ottawa National Wildlife Refuge in Oak Harbor, Ohio. Refsnider’s research, funded in part by a $10,000 Ohio Sea Grant, will continue through 2018. This year, turtles will be trapped and analyzed in May and June, then again in August. In 2018, Refsnider’s team will repeat a spring catch, when algal blooms are absent from Lake Erie, and again in August, when warmer lake temperatures, increased rainfall and other factors contribute to the formation of algal blooms. According to the National Oceanic and Atmospheric Administration, spring measurements and rainfall projections indicate that the formation of harmful algal blooms this summer will be in the “middle of the pack” — neither severe nor insignificant. Since Lake Erie is the shallowest and warmest of the Great Lakes, it is most susceptible to algal bloom formation. Jessica Garcia returned a painted turtle to the water at the Ottawa National Wildlife Refuge. 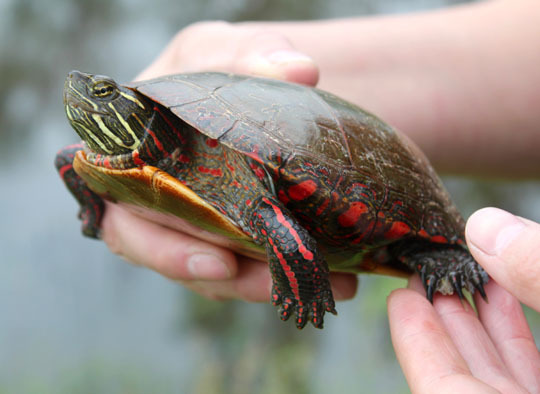 Refsnider said this year she’d like to sample about 80 turtles, including painted turtles, which are the most common to be seen basking on rocks and other structures; map turtles, which live closer to streams and rivers; snapping turtles; and red-eared slider turtles, which are not indigenous to Lake Erie, but are bought in pet stores and sometimes released into the wild. Map turtles will be subject to an additional assay that takes place during 48 hours in Refsnider’s lab. Jessica Garcia checked a net for turtles at the Ottawa National Wildlife Refuge in Oak Harbor, Ohio. She said her team measures the injected area every six hours. None of the turtles, she added, are harmed by tests performed in the field or the lab. Refsnider expects turtle research to be a precursor for further studies among Lake Erie’s wildlife, including water snakes, frogs and water birds. She said water snakes at the Ottawa refuge are similar to the indigenous Lake Erie water snakes found only around the limestone islands scattered near the Catawba/Marblehead peninsula in Catawba Island, Ohio. At UT since 2015, Refsnider was drawn by the opportunity to study how organisms respond to rapid environmental change. The ecological climate surrounding Lake Erie seemed an ideal laboratory. She hopes research that begins with 80 turtles will have broader applications as scientists grapple with the effects of unprecedented climate change. This entry was posted on Monday, June 5th, 2017 at 3:06 am and is filed under Natural Sciences and Mathematics, News, Research, UToday .